I started using the iPad in my toddler story times last fall. I usually project an interactive ebook or do a small app-tivity with the kids and it has been going really well. However, I sometimes struggle during the planning process to come up with fun new apps or ebooks to use. Then it hit me: I beg, borrow and steal ideas from colleagues (both virtual and in person) for other parts of my story times. Why not mix some of those ideas in with technology? Last week I subbed for my co-worker’s preschool story time. We are both doing alphabet themes, and the letter of the week was T. While I was planning, I happened to read article in ALSC’s Children & Libraries called “Participation Palooza! 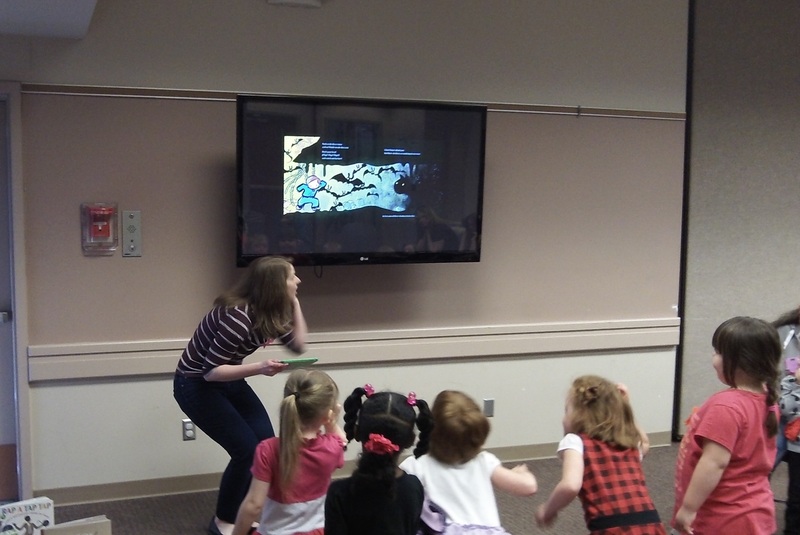 Creating a Festive Storytime Atmosphere with Interactive Books” by Jessica Pyrek. She suggested David LaRochelle’s It’s a Tiger as a book where kids could participate with movement. I remembered that we have that book in our library’s Axis360 collection on the Blio app. I checked it out and downloaded to use with the kiddos. Before the story, I gave clues and had the kids guess which “T” animal we were going to read about next. I told them we were going to put the book on the big screen so we could all see it, and that we all had to stand up so that we could get away from the tiger together. After a brief glitch with the Apple TV (while I rebooted, the kids all assured me that their TVs at home worked), we stood up for the story. The kids had a great time running, climbing ladders, doing the other actions and pointing out the tiger on every page. Since I just had the iPad Mini in my hand, I could do the actions a lot better than if I had been holding the book. This week, I used the iPad for planning and promoted our Digital Kids page in story time in combination with a traditional flannel. I wanted an underwear activity to do with my toddlers and decided to check the Bedtime Math app for inspiration. I found a fun math problem about underwear for wee ones and made a flannel of three pairs of purple-elephant underwear and three pairs of striped underwear to do the problem with my toddlers. During toddler story time, I did a short rhyme about underwear and then I put four pairs on the flannel board in a pattern and told them we were going to do a little problem. I asked them the question, “If you go back and forth between striped underwear and purple-elephant underwear, and you wore stripes yesterday and elephants today, which kind will you wear tomorrow?” They got it right the first time! I then took the opportunity to tell the caregivers why I was doing a math problem (because early math knowledge predicts not only later math success, but later reading success) and told them about the Bedtime Math app. One mom piped up and said that she loved the app and uses it at home with her 3- year-old. After story time, she handed another mom one of our cards that advertises our app lists and showed her how to download the app on her phone! Thanks to Cen, Amy and Littleelit for letting me share. Now I don’t feel so guilty for all of the idea borrowing I have been doing! Naomi Smith is a Youth Services Librarian for Parkland/Spanaway branch of the Pierce County Library System in Tacoma, WA, where she gets to do the Baby and Toddler Story Times. She is also mom to two young children. Her four-year-old son wonders aloud at why a grown-up has so many kids’ games and stories on her iPad. Posted on April 25, 2014, in Apps, Story Time and tagged Naomi Smith. Bookmark the permalink. 1 Comment.